We often assume the place names of various locations we become acquainted with over our life have remained unchanged over time. Having been named for some particular feature on the land, a plant, or in honor of some pioneer family, the identity of the place has remained forever fixed in common usage. Place names can and do change. Chesterton, for instance, was originally referred to as Coffee Creek, a post office being established in the area on January 29, 1835, with pioneer Jesse Morgan serving as the community's first postmaster. Presumably, the post office was named in reference to the creek that runs northerly through the community. The post office changed its name on December 31, 1849, from Coffee Creek to Calumet. The name Calumet is a reference to the Little Calumet River that traverses westerly along the northern boundary of the community. 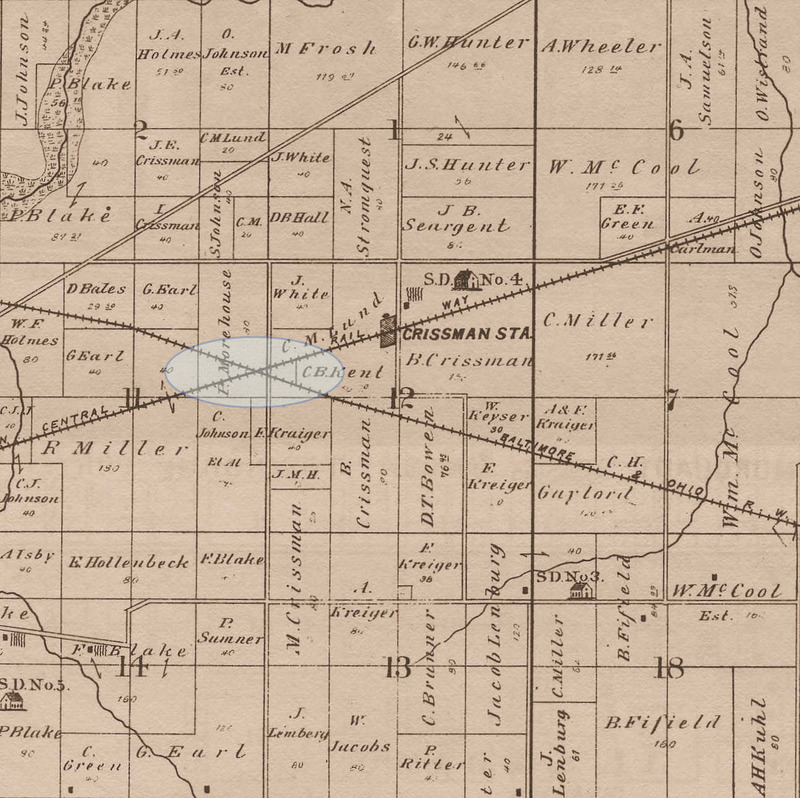 William Thomas officially recorded a plat of the town of Calumet in 1852 containing 46 lots. Though the community's name was officially changed to Calumet, Coffee Creek had persistence and was being regularly used to identify the area in various publications through the Civil War period. The delivery of United States mail, however, was being negatively affected by the fact that a township named Calumet existed in Lake County, Indiana. Mail delivery was often getting mixed up between communities. In addition, the local village was incorporating (for a second time), and an election was held for a new name. Chesterton was the official name adopted by community members' votes on October 5, 1869. 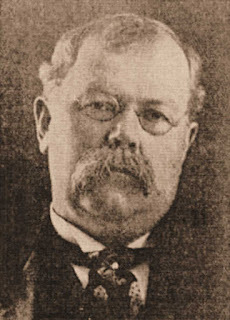 Accordingly, the United States Post Office Department changed the post office designation to Chesterton on January 24, 1870, with David Hopkins serving as the first postmaster under the new name. Coffee Creek and Calumet quickly faded away. Why the name Chesterton? There have been several theories about the choice of this name for the community, but there is no evidence to definitively indicate why the name was chosen. The most common explanation is that the name was a derivative of Westchester, the township in which the community is located. Being the there were several "Westchester" post offices throughout the United States, however, it may be that the derivative name was thought to be a more appropriate course to follow in renaming the reincorporated town; the name of Chesterton would lead to much less confusion and provide a unique national identity. Other place names have changed in Porter County. Hebron was once referred to as Sigler's Corners. The boundaries of Porter now encompass the forgotten communities of Baillytown, Gilbertville, Hageman, and Waverly. Boone Grove was formerly called Jumbo. Present day Pine Township is a mass of confusion with respect to place naming. This township has seen the following succession of names: Lake, West Chester, Berry, Westchester, and Pine. Pine Township was originally named Lake Township by the county commissioners in 1836, but within a few months it was combined with Waverly Township to the west; together, this newly created political division was named West Chester Township. In March 1841, the township known today as Pine was split off from Westchester Township and given the name of Berry Township in recognition of the numerous cranberry and blueberry patches in the region. A remonstrance by the citizens of the newly created Berry Township quickly ensued. Within two months of its creation, the township of Berry disappeared and the area was reattached to Westchester Township by the county commissioners. In 1850, Pine Township was created by the county commissioners, splitting off from Westchester Township and exhibiting nearly the same boundaries of the preceding Lake and Berry Townships. Portage was incorporated as a town in 1959 and was named after the township that embraces it. Prior to Portage, several villages with post offices existed in the vicinity. These included Crisman and McCool. Garyton was another Portage community, but without a post office. Yet another Portage locality, also without a post office, included Willowcreek. The name Willowcreek is still often used today to describe an area and school in Portage. Willowcreek, however, was most often referred to as Joy's Run from 1875 through the 1890s. During the early 1900s, local residents gradually began referring to the area as Willowcreek and the name of Joy's Run faded into history. A. Crisman lost a little boy about 12 years old, from scarlet fever. Incidentally, this "little boy" is believed to have been William Colfax Crisman. Joy's Run refers to a specific incident that took place during October of 1874, and it is the only location in Porter County believed to be named after a historical event. It is also likely that Joy's Run was used as a pejorative by the residents of Porter County given the context of the event. Joy refers to a individual that sparked the incident. That person was James Frederick Joy, President of the Michigan Central Railroad (hereafter Michigan Central), a rail line that continues to traverse through the area known today as Willowcreek. James Frederick Joy, President of the Michigan Central Railroad. Source: Hinsdale's History of University of Michigan, 1906. In 1874, the Baltimore, Pittsburgh & Chicago Railroad, a subsidiary of the Baltimore & Ohio Railroad (hereafter the B&O), was completing the construction of their rail line between the cities of Chicago and Baltimore. 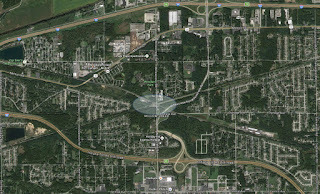 The last area of new construction along this line was located in Section 11 in Portage Township; more precisely, it was located in the east half of the southeast quarter of the northeast quarter of Section 11. Individuals traveling along Willowcreek Road in Portage journey right past this location, and the site of the incident is clearly observable on the west side of the roadway. 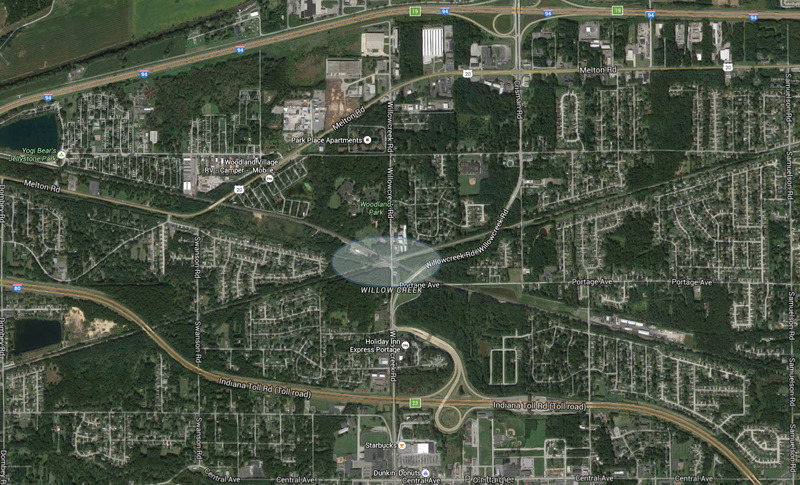 that led to the place name of Joy's Run in Portage Township. Soutce: Hardesty's Illustrated Atlas of Porter County, Indiana, 1876. Today at this particular location two railroad lines cross. 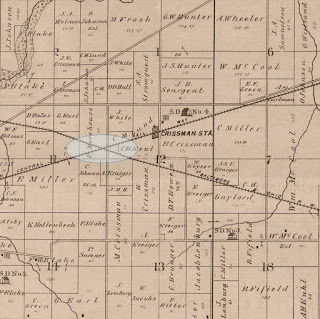 The Michigan Central travels in a northeasterly direction and was constructed through the area in 1851; this railroad connected Detroit and Chicago. The B&O, which was being constructed in a southeasterly direction in 1874, had to cross the Michigan Central tracks. B&O work crews had completed construction of the rail line to the point where a "frog" needed to be installed to cross the Michigan Central. Installation of the frog was the last link to complete the entire line between the cities of Chicago and Baltimore. Run, now referred to as Willowcreek. owned and operated by CSX Transportation. 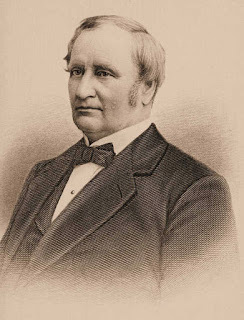 James F. Joy, President of the Michigan Central, was adamant that the B&O Railroad was not going to cross his company's line. Joy's reasoning was that Indiana law required that all trains stop at any location where two rail lines crossed; at this time, electric signal lights had yet to be invented. This requirement to stop trains would have resulted in increasing travel time for Michigan Central trains, thereby increasing company costs. Joy had requested that the B&O cross the Michigan Central tracks farther west, near Lake Station, and that the B&O construct a viaduct so that neither company would have to stop their trains, as required by Indiana regulations. Officials of the B&O denied the Michigan Central request to relocate the crossing and construct a viaduct. 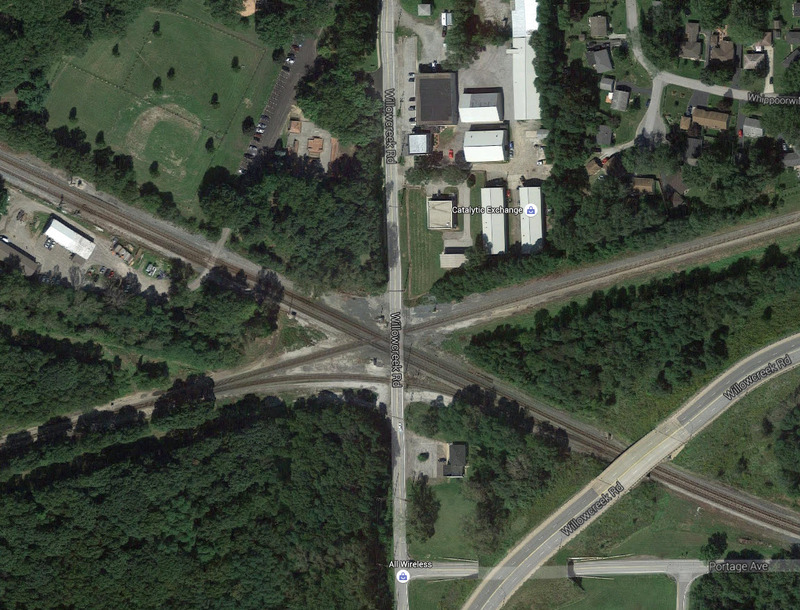 The B&O had a legal right of way across the Michigan Central track and the company intended to install the crossing. Considerable legal wrangling took place, with the both the Circuit Court of Porter County and the United States Circuit Court for the Northern District of Illinois involved with the case. In October 1874, Judge Hiram A. Gillett of the Circuit Court of Porter County heard the B&O's case. The Michigan Central, the defendants in the case, refused the B&O's crossing of their tracks based on the argument that commissioners should first be appointed to fix both the location and manner of the crossing. Michigan Central officials likely surmised that commissioners would fix the location farther west and require the manner of crossing to be a viaduct. Apparently the Michigan Central argument was neither compelling nor consistent with law since Judge Gillett decided in favor of the B&O and appointed three appraisers to assess the damages for the right of way over the Michigan Central tracks. The damages were expected to be nominal since they would only embrace the value of the land necessary for the B&O right of way, which was represented by a small sliver of land. A preliminary injunction had been issued in United States District Court soon after Judge Gillett's decision. The preliminary injunction prevented the B&O from constructing their track across the Michigan Central track until further facts and evidence could be gathered by the court. 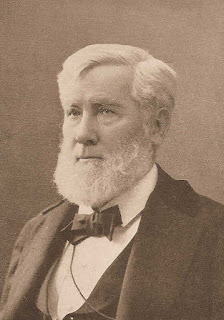 On October 16, 1874, however, Judge Thomas Drummond of the United States Circuit Court for the Northern District of Illinois dissolved the preliminary injunction, his reasoning was that his court did not have jurisdiction in the matter. Thus, the decision of Circuit Court in Porter County could be relied upon by the B&O. Interestingly, Judge Drummond intimated in his decision that the B&O's grade crossing of the Michigan Central tracks ought to be avoided, if possible. For the next few days, B&O work trains and their associated crew attempted to install track across the Michigan Central line. In response, Michigan Central President James F. Joy ordered his crews to excavate deep trenches on both sides of the Michigan Central track, erect fencing, and place barricades, all in the effort to thwart the B&O's efforts to cross the Michigan Central line. In addition, President Joy had trains continually cross back-and-forth over the location where the B&O needed to place their track across those of the Michigan Central. Meanwhile, Judge Gillett issued a writ, which was delivered to Porter County Sheriff Robert P. Jones. Soon after the issuance of the writ, Sheriff Jones, his deputies, John Kissig Cowen, an attorney for the B&O, and a posse of twenty men proceeded to the location where the B&O intended to cross the Michigan Central. serving in that capacity from 1896 to 1901. Source: Stover's History of the Baltimore & Ohio Railroad, 1987. Remarkably, these men were confronted by a mob of 1,500 employees of the Michigan Central (Portage Township's population at this time was approximately 750). These employees of the Michigan Central had been purposely transported to the site by President Joy; they were were armed with guns, crowbars, clubs, and "villainous looks." As Sheriff Jones read the writ of the court mandating that the Michigan Central allow the B&O to cross their track, the Michigan Central employees jeered and laughed, while the Michigan Central trains blew their whistles to drown out the Sheriff's voice. Flummoxed by the actions of the mob, a decision was made whereby the Sheriff and his posse would remain at the location of the dispute, while the other men proceeded back to Valparaiso and to contact Indiana Governor Thomas A. Hendricks. Governor Hendricks pulled no punches and on October 19, 1874, he commanded the Indiana State Militia to proceed to scene of the mob and assist Sheriff Jones in enforcing the writ of Circuit Court of Porter County. Headline published in the Chicago Daily Tribune on October 22, 1874. Upon orders of Governor Hendricks, Captain Theodore B. Wightman of the Indiana Guards departed Indianapolis with his troops for Michigan City on the evening of October 19. Also traveling with the militia was Indiana Adjutant General William W. Conner. Upon their arrival in Michigan City, the troops boarded a B&O train and traveled westward toward the scene of activity. At 8:00 in the morning of October 20, the B&O train arrived; the locomotive had American flags draped on it, making a grand appearance as it rolled to a stop in front of the large throng of railroad employees, law enforcement, and local citizens. Captain Wightman had a platform placed at the front of the engine that carried several troops, as well as two imposing Gatling guns. Newspaper reports state that the Michigan Central men fell silent when the guns were pointed in their direction, but held their ground. until his death on November 25, 1885. Services of Hon. Grover Cleveland, 1884. The Michigan Central man of authority at the site of the disturbance was Chief Engineer Henry Alanson Gardner. After the arrival of the Indiana Militia, Gardner proceeded to meet with Captain Wightman, Adjutant General Conner, and the B&O's attorney John K. Cowen. Cowen, in particular, had been extremely patient with the antics of the Michigan Central, using time consuming legal channels to clear the mess thrown in the way of the B&O. Cowen had encouraged Gardner to discuss the matter rather than have lawmen involved in settling the dispute by enforcing the court's writ and executing a multitude of warrants for the arrest of the Michigan Central rioters. When Gardner accepted Cowen's request, Sheriff Jones and a constable attempted to execute a warrant for his arrest, which troubled Gardner considerably. The threat of arrest, however, may have ultimately led to a peaceful resolution by underscoring the seriousness of the matter. 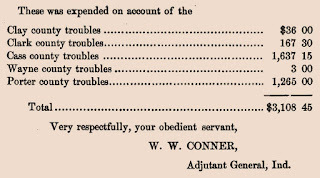 Adjutant General Conner requested of the lawmen that he and Gardner attempt to negotiate a resolution to the dispute, with Gardner acting as the conduit to President Joy. Both Conner and Gardner then left the site of the disturbance and ventured to Lake Station, presumably since this was the nearest location with lines available to communicate with Joy. Gardner telegraphed Joy to inform him of the deteriorating status of the standoff. President Joy apparently realized that his show of force was not going to work as he had planned; the B&O was going to cross the Michigan Central line. President Joy replied back to Gardner, telegraphing that the legal process must be observed and that he had no desire for shooting or killing. He informed Gardner that the companies could dispute the crossing using the legal process after the B&O had installed their track across the Michigan Central's. The militia waited patiently for events to unfold. After an absence of several hours, Chief Engineer Gardner and Adjutant General Conner returned to the scene of the dispute. They informed the Michigan Central workmen that President Joy had ceded to the court's decision. The workmen were to disperse and allow the B&O crews to install track and the frog across the Michigan Central line. The Michigan Central's "surrender" took place at noon. Afterward, the construction team of the B&O commenced to remove the barricades and fill in the trenches. Meanwhile, the Michigan Central trains and boxcars that were blocking the way were moved so that the B&O crew could install the crossing. Sheriff Jones had a considerable problem to contend with since it would not be possible to arrest 1,500 men and bind them over to the Justice of the Peace. Warrants had been issued for the arrest of all rioters, meaning all of the Michigan Central employees at the site. It was decided that since the vast majority of the Michigan Central men were merely following company orders and were completely ignorant of the legal issues surrounding the matter that they would be released. However, a few of the Michigan Central employees, those considered the principal malefactors, were arrested and charged with rioting and other criminal violations. All but Chief Engineer Gardner were kept under guard. During the evening of October 20, the above named prisoners were taken before Justice Thomas J. Fields, of Portage Township. Meanwhile, the troops purchased a load of straw for use as bedding from area resident Franklin Blake and camped out for the evening. As it appeared that peace had been achieved, the militia returned to Indianapolis the following day "covered with glory, having won their first grand victory." the dispute at Joy's Run in Portage Township using state militia. the State of Indiana for the Year Ending December 31, 1874. On Tuesday, October 28, the Porter County prosecutor dismissed the cases against those Michigan Central men that were arrested and all were discharged. Thus, no convictions resulted from the activity that took place between the B&O and the Michigan Central. The only lasting outcome of the dispute was the naming of the location as Joy's Run. Why did the B&O demand crossing the Michigan Central's track in Portage Township instead of constructing a viaduct farther west as suggested by the Michigan Central and recommend by Judge Drummond? Obviously, there would have been a cost associated with constructing a viaduct, as well as the time involved in laying additional track, raising the railbed approaches, and constructing the overpass. The B&O was attempting to monetize their enormous investment as quickly as possible. However, the B&O may have demanded the crossing in order to reinforce their property rights; railroad property rights were being heavily contested in the courts across the United States during the 1870s. Ceding to the wishes of Michigan Central may have weakened their position in other property rights cases. Alternatively, the B&O may have pursued the construction of the track crossing as a bargaining ploy against the Michigan Central. Weakening the Michigan Central would allow the B&O an improved negotiating position in future disputes. Every business decision by the railroad was likely viewed, to some extent, by how much leverage it would provide against competitors. Massive growth in the number of railroads across the country initiated the formation of railroad trusts in the 1870s, as well as spurred consolidation in the industry, all in the effort of increasing the pricing power among the larger railroads. The formation of trusts and the increasing number of mergers ultimately contributed to the passing of the Sherman Antitrust Act in 1890. This act was passed by Congress in an effort to increase price competition, especially in the rail and oil industries. Regardless of the B&O's intent, the area in the vicinity of the B&O and Michigan Central dispute was given the moniker of Joy's Run, a name that firmly stuck with it until the early 1900s. The motivation of James F. Joy in impeding the B&O's right of way crossing of the Michigan Central line did not go without notice in the media. The Michigan Central was experiencing issues in paying dividends to company shareholders for some time. In fact, dividends were temporarily suspended immediately prior to the Portage Township incident in order to cover expenses in expanding the Michigan Central's reach. ".... How much Mr. Joy had the interests of the road at heart is demonstrated by the determined fight he made against the Baltimore & Ohio Railroad. We think here Mr. Joy made a mistake. He should not have permitted his road to antagonize the law of the State. He must have known that in the end he would have been worsted in the attempt. The act was unjustifiable; but it shows at least that Mr. Joy was determined to spare no effort to guard the interests of the road and of the owners of its stock. If Mr. Joy actually resigns, the Michigan Central will lose much more than he can possibly lose. He has reached an age at which men usually take repose, if they ever take it. He is a man of ripe culture and solid learning, of fine literary and social tastes. He has earned a restful and green old age, and while there is probably ten years of hard work in him yet, if he chooses to work, there is a longer and more enjoyable time before him if he ceases to be the manager of the Michigan Central and its immense network of affiliated railways." President Joy was ousted from his position in 1876 when William Vanderbilt purchased a majority interest in the Michigan Central and summarily voted him out. Michigan Central's Chief Engineer, Henry Alanson Gardner, died in Chicago nine months (July 26, 1875) after the Battle of Joy's Run following a protracted illness. Near Lake Station, Porter County. Though the Circuit Court of Porter county, Ind., as well as the United States Circuit Court, have decided that the Michigan Central Railroad should allow the Baltimore & Ohio Railroad to cross its track near Lake Station, still that company refuses to abide by the decisiors of the Courts, and bids defiance to its mandates and officers. The prevent the Baltimore & Ohio from crossing its track, it has taken the law into its own hands, and placed all kinds of obstructions in the way, and stationed there an army of men to watch day and night that no coup d'etat is attempted by the Baltimore & Ohio. The latter road has thus far acted entirely on the defensive, believing that after the decisions of the courts were given the opposition to their crossing would cease. After the last decision by Judge Drummond the Solicitor of the Baltimore & Ohio requested Mr. Gardner, the Chief Engineer of the Michigan Central, to name time and day when it would be most convenient to his road for the crossing to be made. The answer was that they should prevent the crossings by force, and in no event permit it. Therefore the officers of the Baltimore & Ohio, having arrived at the point where patience ceases to be a virtue, called upon the sheriff, of Porter county, Indiana, to aid them in making the crossing. Yesterday morning about 6 o'clock the attorneys for the Baltimore & Ohio, Judge Cowan, of Baltimore, Judge Anthony and Mr. Jones of Valparaiso, Ex-Governor Baker, James Hemshire, L. Randolph, Chief Engineer, James Walsh, General Agent, and a construction corps of about fifty men, together with Robert P. Jones, Sheriff of Porter county, Harvey Patrick, Deputy, and a posse of twenty citizens, went to the place where the crossing is to be made. On arriving they found upon the ground a force of 300 men placed there by the Michigan Central, to oppose the crossing by the Baltimore & Ohio. There were also standing upon the main track of the Michigan Central, just across the right of way, three construction trains. To allow the regular trains to pass, a side-track on the north side of the main track had been constructed. Barricades of ties, rails and wood had been placed on each side of the crossing between the main track and the fence, and each barricade was manned by a number of men ready to annihilate anyone who should touch the pile. As an additional precaution deep ditches on each side had also been dug and inside the ditches camp-fires were brightly burning, with numbers of men around them. 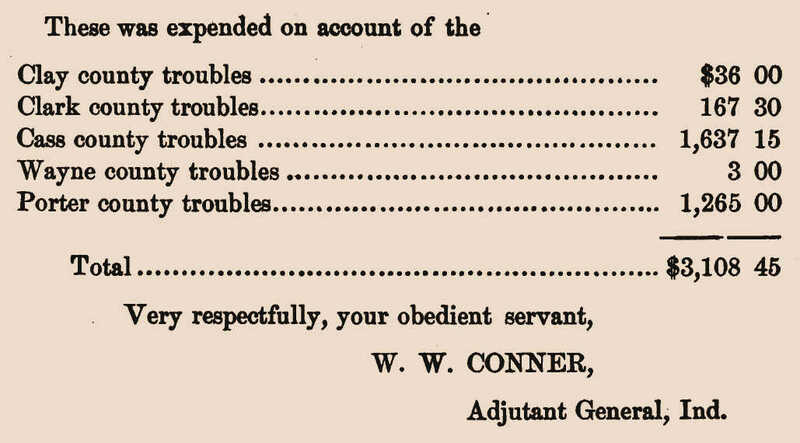 Judge Cowan, the Solicitor of the Baltimore & Ohio, asked the men under whose orders they were acting, and they answered under the orders of Chief-Engineer Gardener. Not finding Mr. Gardener on the ground, the officers of the Baltimore & Ohio, in the presence of the Sheriff and his posse of citizens of the county, climbed the fence, and endeavored to storm the barricades. But in a moment the army of the Michigan Central was upon them, and the attacking party was compelled to fall back considerably demoralized without having obtained possession of the track. This attempt to take possession of the crossing was not made until the Solicitor of the Baltimore & Ohio had publicly announced that they came in the name of the Company, and after the court had decided they should cross. It was also announced that the Sheriff was present to put the Company in possession under a writ issued by the Circuit Court of Porter county. The writ was read to the crowd, and attentively listened to, and then explained by the Solicitor, who stated that to resist the writ was a criminal offense, and punishable by a fine of $5,000 and six months in the penitentiary. The Sheriff and his posse then endeavored to take possession of the crossing, by they were also routed, and forced to a precipitate retreat. The Solicitor again begged the men to disperse and allow the law to take its course, or else they would be prosecuted for riot, rout, forcible detainer, obstructing legal process, and other offenses. Horrible and long as the list of crimes is, the men did not care a snap for the penalties, not budging and inch from their position, claiming that they had been placed there by superiors, and all they had to do was to obey. The Sheriff then attempted to arrest the leaders of the army of occupation, and take them before the nearest Justice, to be dealt with according to law, but he was not allowed to lay hands upon any of them. The next step was the procurement of warrants for a number of the men, and afterward an attempt was made to serve them, but this was again prevented by force, and legal process obstructed. While the warrants were being read, the crowd booed and yelled, the engines whistled, and puffed, and shrieked, creating such an uproar as to drown the words of the person reading the writs. The Assistant Roadmaster Watts, of the Michigan Central then mounted one of the barricades and publicly proclaimed that he'd be d----d if a single man should be arrested from that force. He acted under instructions to resist all process of law, and to hold the crossing at all hazards. One of the men of the Baltimore & Ohio construction corps who was called upon by the Sheriff to identify some of the ringleaders was roughly handled by the crowd, and informed that, should he be seen again on the ground of the Michigan Central, it would be the last of him. Notable, among the most violent and most blatant in the crowd was a man said to be a Marshal of Michigan City. This man would not be content with anything less than bloodshed and riot. During the day large reinforcements were received by the Michigan Central force, and, in the evening, they must have been at least 1,000 strong. These men were all workmen in the Company's employ, and brought there from all along the road. When the reporter left at about 7 o'clock in the evening, the grounds reminded one of a grand bivouac in the army, large groups of men sitting around camp-fires, singing patriotic songs, encouraging each other for the coming battle. Orders were received about 6 o'clock to cease hostilities until this morning, as the Governor of Indiana, to whom an appeal for help had been made, had telegraphed Mr. Joy, the President of the Michigan Central, to withdraw his force at once. Mr. Joy is said to have replied that he would be on the ground himself at 5 o'clock in the morning. Should the Michigan Central continue to obstruct the process of law, there is hardly doubt the Governor will call out the militia to bring the insurgents to terms. The Sheriff of Porter county informs me that he is resisted with force in the execution of legal process by several hundred men in the employment of your Company, and he calls upon me for military force to maintain the legal authority. I call upon you to interpose your authority as President of the company to suppress this violent resistance, and to disband the employes of your Company now in armed resistance to law. Up to 8 o'clock this evening no response had been received from Mr. Joy. However, it is not believed that serious trouble will ensue. Forces of the Michigan Central, massed near Lake Station to prevent the Baltimore & Ohio from crossing its track at that point, have surrendered to the militia sent by Gov. Hendricks to aid the Sheriff in enforcing the law. The crossing has been made without shedding a single drop of blood, although it looked for a long time yesterday morning as if rivers of it would have to be spilled before the barricades occupied by the Michigan Central forces could be stormed. The Michigan Central people, feeling the responsibility they were incurring, gave way to reason at the last moment and ordered their men to surrender to militia. When a Tribune reporter arrived at the grounds yesterday morning at 6 o'clock, the situation remained unchanged from what it had been the day before. There were still about 1,000 Michigan Central men guarding the crossing, most of them taking their breakfast, which they had prepared by the bright burning camp-fires. The officers of the Baltimore & Ohio, and the Sheriff and his posse were also still on the ground, though they had concentrated themselves somewhat to the rear, and taken up a good defensive position in a shady grove, about 200 feet distant from the Michigan Central track. No sooner did they espy the reporter than they rushed upon him for the paper, and, after careful reading the account of the previous day's proceedings, they pronounced it most impartial and correct statement of what had been going on. The militia, which had been expected to arrive at 5 o'clock, had not yet made its appearance. The men on both sides were quite orderly, and no attempt at arrest or disturbance were made, each one feeling that matters must come to a focus with the arrival of the militia. At 8 o'clock a train on the Baltimore & Ohio was observed coming up, and at once everybody was astir knowing that, as no regular trains were running on the Baltimore & Ohio, this must be the train with the anxiously expected soldiers. As the train came nearer the United States flag was seen proudly floating over the engine and two ugly-looking Gatlin guns were on a platform car in front of the locomotive, pointing directly at the Michigan Central forces, who, perceiving what was going on, at once massed at the barricades, some crying "Now the dust will fly!" but most of them remaining quiet, and with folded arms awaiting the events to come, apparently feeling shaky and uneasy at the bloody prospects ahead. The soldiers, who numbered about 150 men, alighted and formed a line. They were quite a motley mass, wearing uniforms of all colors and patterns. Still they were armed with splendid Springfield breechloaders, the cartridges rattling in the cartridge-boxes, and their bayonets looking bright and sharp. Capt. T. B. Wightman was in charge of the company. Mr. W. W. Connor, Governor Hendricks' Adjutant General, was also along to direct matters in person and to allow no unnecessary blood to be spilled. A portion of the company were then formed into a hollow square directly facing the crowd on the barricades, while another detachment was placed on the switches, at either end of the crossing, to prevent the rioters from getting away and to stop trains from going one way of the other without being first examined. Capt. Wightman, Adjutant-General Conners, and Sheriff Jones then went up to the crowd and asked for the person in charge. The answer was that no officer of the Company was present, but their orders came through Mr. H. A. Gardner, the Chief Engineer of the road. As no one could or would tell where Mr. Gardner could be found, Capt. Wightman ordered his company to get ready for a charge on the enemy with a view of surrounding and arresting the whole crowd. Matters looked now very dangerous; the soldiers stood with fixed bayonets, waiting only for the command of "Forward!" to make a bloody charge. The Michigan Central men, who had amassed on the barricades, stood calm and collected, making no threatening demonstrations nor uttering a word of complaint. They stood like statues, eyeing the movements of the State Guards and the motions of the Gatlin guns with fixed eyes. Undoubtedly, judging by their pale countenances, they felt their dangerous position, but outwardly they showed no sign of fear. These men had been ordered by their superiors, the officials of the road, to hold the crossing at all hazards, and they were bound to obey and stay at their post. Yet what a contrast between these men and the officials of the road. During the entire time while hostilities were going on, not one of them appeared on the grounds. They left the men entirely to themselves, and to bear the brunt of all danger. How differently did the managers of the Baltimore & Ohio act. Their workmen were left in the back, but they themselves were always in the front, aiding the militia, the Sheriff, and constables everywhere. Particularly conspicuous was Judge Cowan, of Baltimore. On a white charger, he rode up and down the lines, cheered the men on his side, and then galloped up to the opposing forces and warned them of the consequences of resisting. Everybody admired his boldness, and even the enemy respected his intrepidity. Everything was deadly silence now, and only the command was wanting to see that line of glistening bayonets marched through that crowd of men on the barricade, all of whom, stood like posts, yet none of them giving the least sign of resistance. The reports, of whom no less than six were present, -- Indianapolis and Cincinnati even having sent its quota, -- stood expectantly by with lead pencils and notebooks in hand. Of a sudden a messenger came to the Captain asking not to give the command to attack until Mr. Gardner, who had just arrived, had had an interview with some of the officers of the Baltimore & Ohio Railroad. Governor Baker, on the solicitors, asked Mr. Gardner, whom he found standing outside the fence dividing the grounds of the Baltimore & Ohio from those of the Michigan Central, to walk inside, as the Chief Engineer of the Baltimore & Ohio, Adjutant-General Connors, and others, were watching events on a bluff a little way back. As Mr. Gardner evinced some fears of coming in, Governor Baker assured him that he would not be harmed. Thereupon he entered, and was led by the Governor to the other officials of the Baltimore & Ohio and the State officers. Mr. Connors asked Mr. Gardner if he was not aware of the fact that he was committing a great crime. He replied that he was not aware of it, no violence having been made by his men. By this time Mr. Jones, the sheriff of Porter county, came up to the group, and, recognized Mr. Gardner, grabbed him by the arm, and declared him his prisoner for obstructing process of law. Mr. Fishburn, the Constable of the county, came up also by this time and took hold of Mr. Garnder on a warrant for inciting riot. If Mr. Gardner had been struck by lightning he could not have looked more surprised. He turned ashy pale, and tremblingly wanted to know why he was treated thus. He called upon Governor Baker to release him, as he was assured safety by him should he enter the grounds of the Company. Mr. Baker said he had no power over the officers; he had assured him safety, but not immunity from arrest. The Governor, however, was in favor that he should be let alone until he had talked with the officials present in regard to his retention. The officers thereupon released their hold; but, no sooner had they done so, than he commenced to run for the barricade, where his men were massed, but both the Sheriff and Constable were after him like lightning, and brought him safely back. During all these proceedings the Michigan Central men made no effort to assist their Chief Engineer; they looked on, as if it concerned them not at all, and rather seemed to enjoy his discomfiture. Mr. Gardner then requested the officers read to him the warrants and writs under which they were acting, saying that was his prerogative and he would insist upon it. The Sheriff's order of taking possession covered about thirty pages of foolscap, and it was already agreed that he already knew all its contents, and to read it would cause an additional delay of at least two hours. But as Mr. Gardner remained firm in his demand to hear the paper read in full, the Adjutant-General thought it the best policy to comply, and therefore sat down with him on a railroad tie and commenced the tedious job of reading that legal document. As it was claimed that Mr. Gardner was doing this to give his men a chance to disperse in the mean time and be taken off by trains waiting near by before they could be arrested, Capt. Wightman took the precaution to post his men all around the Michigan Central men, placed guards in charge of the switches, and gave orders that no trains be allowed to pass one way of the other if any men were taken on board. Nor were any men allows to pass the pickets without a pass. The reading of the document took a long while, Mr. Gardner often interrupting for the purpose of gaining time, and the troops began to grumble, they having had nothing to east since they left Indianapolis the evening previous. The rations which the officials of the Baltimore & Ohio had ordered had not arrived. Mr. Gardner, being appealed to no to insist longer on the reading the document, as the men were almost starving, offered the provisions which had been provided for his men for the use of the soldiers. His offer was accepted, and a wagon-load of provisions soon made its appearance. All discipline was now thrown aside, and the half-famished warriors charged on those provisions and in less than no time the entire load was disposed of. The troops felt better after having refreshed themselves, and they were bound now to do something. As it had been learned that Mr. Johnson, the Roadmaster, was hid in a car, and as he had acted as leader most of the time, search was made for him with a party of soldiers, but he was not found, but instead several of those that had been most violent and blatant the day before were taken in charge and placed under arrest. About this time the reading of the document was finished, and the Sheriff again attempted to arrest Mr. Gardner. He asked to be allowed to go off for a few minutes with the Adjutant-General. He would have things amicably settled; at the same time he gave his word of Honor that he would deliver himself up after that. His request was, after a long controversy and at the special request of the Adjutant-General, granted. They walked off together, and after awhile it was ascertained that they had gone to Lake Station. Everybody had wondered what they had gone there for, and why the Adjutant-General was allowing such delay. While they were at Lake Station a lively incident occurred, which nearly came to be a bloody one. Judge Cowan sent off a messenger on horseback to Miller Station with a dispatch. When the messenger passed on the engines standing on the track the engineer commenced to ring the bell and blow the whistle, for the purpose of frightening the horse, and he succeeded in his object. Sheriff Jones, who stood near by, attempted to arrest the perpetrator of this outrage, but the other men on the engine resisted, and tried to push him off. He called for help, and Judge Cowan ran to his aid and took hold of two of the men, keeping them at bay, while the Sheriff was calling for the aid of the militia. The soldiers rushed to their guns, the drums were beat, and they came on in double-quick with charge bayonets. The men on the train, when they saw this, resisted no longer, but willingly allowed themselves to be arrested and marched off by the guards. After a long absence, Mr. Gardner returned from Lake Station, and announced that the managers of the Michigan Central had decided to make an unconditional surrender. Mr. Gardner then went on the top of the barricade on which his men were massed, and advised to surrender to the State guard, who were acting under the orders of the Governor. The company by surrendering, he said, did not cede any of its rights, by they merely submitted to the orders of the Governor and the superior force. The men were undoubtedly glad to leave their perilous position, and they at once left the barricades and ditches and massed next to the gate of the fence. The soldiers then surrounded them, and marched the entire crowd within the inclosure as prisoners, and no sooner were they inside than the Gatlin guns were arranged to cover them. They submitted like a herd of cattle, and no demonstration by any one was made, They squatted on the ground and patiently awaited the events that were to come. The surrender was made at exactly 12 o'clock P.M. The construction corps of the Baltimore & Ohio then marched up and commenced to remove the barricades, which was down with lightning speed. The trains which had been standing on the track were also moved out of the right-of-way by order of Mr. Gardner. As immense force went to work at once, and put in the crossings over which so much has already been said, and which has caused already more trouble than any other crossing ever constructed. This completes the link of the Baltimore & Ohio, which can now run its trains direct from this city to Baltimore. The question now arose what to do with all the prisoners, it being impossible to keep 1,500 men under arrest and bind them over before a Justice of the Peace, three of whom were on the ground lobbying to secure the job. In view of the fact that these men had merely obeyed instructions, and were ignorant of the fact that they were committing a crime, it was decided to pick out a few of the ringleaders and let the balance go home with a warning. As the men left the grounds they lustily cheered by the noble defenders of the State of Indiana. Mr. Gardner stated in a conversation with a Tribune reporter that he had telegraphed to Mr. Joy for instructions as soon as he heard of the arrival of the militia, and as he was momentarily expecting an answer, he used all means at his commend to secure a delay. For this reason, also, he took the Adjutant General to Lake Station, as the dispatch would come there. While there, the anxiously-awaited dispatch arrived, in which Mr. Joy said that legal process must be observed. They wanted no shooting nor killing; they would have enough of that after the crossing in ins. On the strength of this dispatch Mr. Gardner surrendered. The following are the names of the parties arrested, regular warrants for riot &c. having been sworn out against them: H. A. Gardner, chief engineer; Joseph Johnson, roadmaster; Jas. Potts, assistant roadmaster; Patrick Hoburn, fireman; W. H. Freeman, engineer; John O'Niel, foreman; Geo. Lock, machinist; George Lawrence, conductor construction train; Hiram R. Johnson, conductor construction train; G. Weich, yard hand; L. McIntyre, conductor construction train; Alva C. Spaulding, carpenter; Patrick Donnelly, track repairer; Henry Kickheiser, engineer. Mr. Gardner the chief engineer was not kept under guard like th rest of the prisoners, but allowed to be around on his parole. In the evening, all the prisoners were taken before Justice Thomas J. Fields, of Portage township, and held over for the action of the criminal court. The Indiana State Guards will remain on the scene of the late disturbance until to-day, when they will return to Indianapolis, covered with glory, having won their first grand victory. Conner, W.W. 1874. Annual Report of the Adjutant General of the State of Indiana for the Year Ending December 31, 1874. Indianapolis, Indiana: Sentinel Company. 8 p.
Anonymous. 1874. Baltimore, Pittsburgh & Chicago. The Railroad Gazette 18:418. The Chicago Daily Tribune, Chicago, Cook County, Illinois; October 20, 1874; Volume 29, Number 58, Page 1, Columns 3-4. Column titled "War Imminent. Railroad Employes Belligerently Assembled Near Lake Station, Ind." The Chicago Daily Tribune, Chicago, Cook County, Illinois; October 22, 1874; Volume 29, Number 60, Page 5, Column 5. Column titled "Railroad News. Mr. Gardner Calls on the Baltimore & Ohio Officers. This Road Refuses to Sign the Saratoga Agreement. Rumored Resignation of Mr. Joy." Porter County Vidette, Valparaiso, Porter County, Indiana; October 22, 1874; Volume 18, Number 43, Page 1, Column 1-2. Column titled "Railroad Intelligence." Porter County Vidette, Valparaiso, Porter County, Indiana; October 22, 1874; Volume 18, Number 43, Page 2, Column 2. Column titled "Local." Porter County Vidette, Valparaiso, Porter County, Indiana; October 22, 1874; Volume 18, Number 43, Page 2, Column 6-9. Column titled "Insurrection! Railroad Employes Belligerently Assemble Near Lake Station, Porter County." The Chicago Daily Tribune, Chicago, Cook County, Illinois; October 23, 1874; Volume 29, Number 61, Page 4, Column 4. Column titled "Mr. James F. Joy as a Railway-Manager." Porter County Vidette, Valparaiso, Porter County, Indiana; October 29, 1874; Volume 18, Number 44, Page 1, Column 2. Column titled "Railroad Intelligence." Porter County Vidette, Valparaiso, Porter County, Indiana; October 29, 1874; Volume 18, Number 44, Page 3, Column 2. Column titled "Local." Porter County Vidette, Valparaiso, Porter County, Indiana; October 29, 1874; Volume 18, Number 44, Page 3, Column 3. Column titled "Local." The Freemont Weekly Journal, Freemont, Sandusky County, Ohio; October 30, 1874; Volume 22, Number 44, Page 4, Column 4. Column titled "The Michigan Central Railroad Defies the Laws of Indiana with Force of Arms." The Vidette-Messenger, Valparaiso, Porter County, Indiana; July 6, 1935; Volume 9, Page 1, Columns 3-4 and Page 8, Column 3. Column titled "The Battle of Joy's Run" by W. A. Briggs. The Vidette-Messenger, Valparaiso, Porter County, Indiana; August 18, 1936; Volume 10, Section 3, Pages 15-16. Column titled "Crisman High School History of Portage Township." Do you have any info about Gilbert Ashville Pierce who was a lawyer, in Valppriso and fought in the civil war? There's quite a bit of information available concerning Gilbert Pierce. Is there something in particular that you're trying to find out? During this time period, the state would grant railroad companies the right to cross the state based on preliminary surveyed routes. If granted a right to establish a line, the railroad would then go through the process of purchasing property along the route. Sometimes the route would change slightly from the preliminary survey, usually due some land feature (water, grades). Very rarely would landowners not sell since a railroad was perceived as a ticket to potential building of wealth for lands adjacent to the railroad route. With regard to crossing at Joy's Run, the B. & O. had the right to cross the Michigan Central tracks given their grant by the state. Hello, I was the one who asked the question, do you know of or did you use any sources that could tell me what you said. I need to use sources for the project that I am doing over Joy's Run. No, I was unable to find the location in Lkae Station. Note that at the time Lake Station was known as "Lake" and sometimes (though rarely) "Laketon."